West Windsor, N.J. - New Jersey Assistant Attorney General Wanda H. Moore will discuss crime prevention strategies that are key to building support networks for incarcerated youth and their families in her talk, "Prevention to Re-Entry: Creating a Safer and Healthier Community," on Tuesday, Nov. 22 at 12 noon at Mercer County Community College. This free lecture is open to the public and will be presented in the Communications Building, Room 110, on Mercer's West Windsor campus, 1200 Old Trenton Road. Serving as the director of the Office of Community Justice within the Office of the New Jersey Attorney General, Moore implements community-based crime prevention strategies that provide incarcerated youth with the tools necessary to succeed once they re-enter the community. Prior to her current post, Moore served as director of Prisoner Re-Entry for the City of Newark, where she orchestrated the development of the Newark Prisoner Re-entry Initiative, a key strategy of inclusion introduced by Mayor Corey Booker. The Newark initiative focused on reducing crime and recidivism, preparing returning ex-offenders for success in the labor market, and providing a range of case-managed direct and referral services to address the needs of this population. Previously Moore was a deputy public defender, serving as one of the first drug court public defenders in the state. In this capacity, she was responsible for staffing the Essex County Drug Court Program. She was also appointed the first statewide drug court director for the Office of Public Defender. Committed to community activism, Moore has served as a board member of the National African-American Drug Policy Coalition. She is the past president and a founding member of the Thurgood Marshall Action Coalition, a national organization of drug court professionals dedicated to ensuring access to drug courts and framing critical research questions to support evidence-based treatment options for people of color. 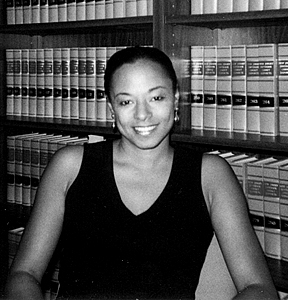 Moore earned a bachelor's degree from Brown University, a law degree from Northeastern University School of Law and a master's degree in Education with a specialty in conflict resolution from Lesley University in Cambridge, Mass. This lecture concludes Mercer's Distinguished Lecture Series for the fall semester. Check back for the listings for the spring here or call 609-570-3324.